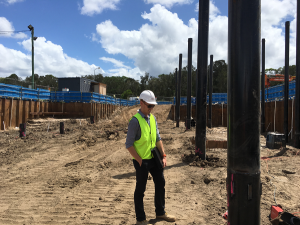 MPN are delighted to be working with Tricare’s Construction and Development Manager, Aaron Jeanneret-Gris and the rest of the Tricare team in providing Civil and Structural Engineering services on this state of the art aged care project. Basement shoring is complete, with screw piling and excavation almost complete. MPN Project Engineer Will Messer reviewing the progress on site.